I'm a long time fan of overnight oats. They were one of the first vegan meals that I started eating regularly and five years later, they're still on repeat in my kitchen. Overnight oats are great for so many reasons, but probably my favourite three things are that they're quick and easy, that they're packed full of energy so make a great breakfast and thirdly, that you can combine almost anything with them and get super creative with your flavours! 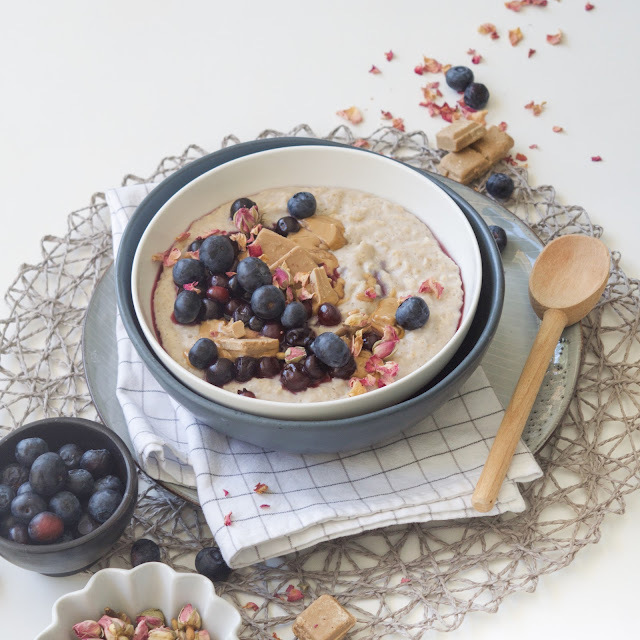 While I've been known to get wild in terms of flavours, this time round I thought I'd recreate a well-established breakfast favourite - Bircher Oats! I think the best part about these oats is the flavour that using half a cup of apple juice brings. 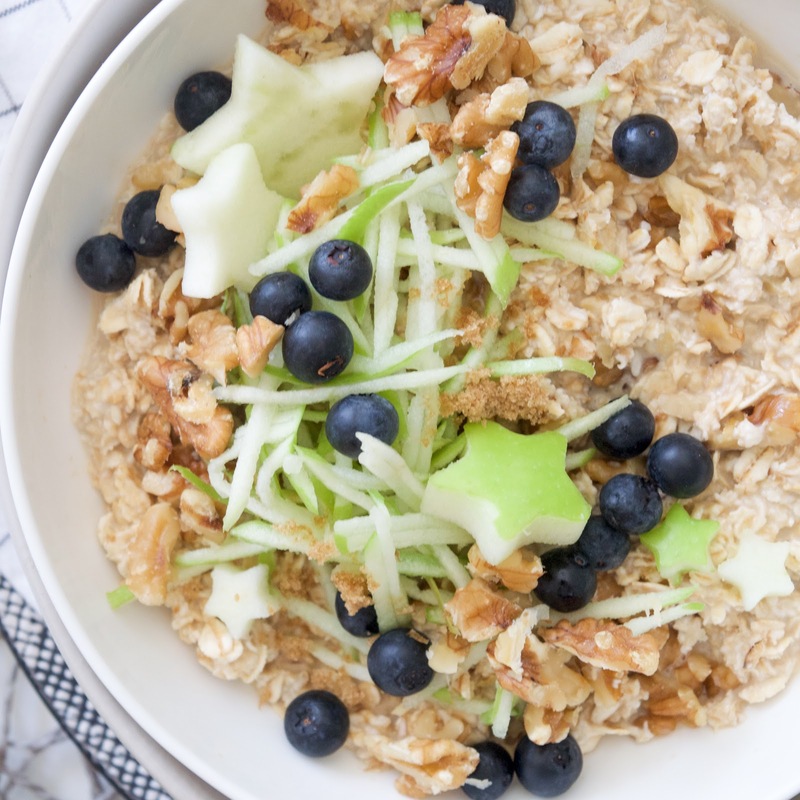 Using half juice and half milk makes the oats super creamy, deliciously sweet and really brings out the classic flavours that bircher is known for. Complete with chopped walnut and pops of crunchy apple, I think I've possible found my new fav breakfast! 1. 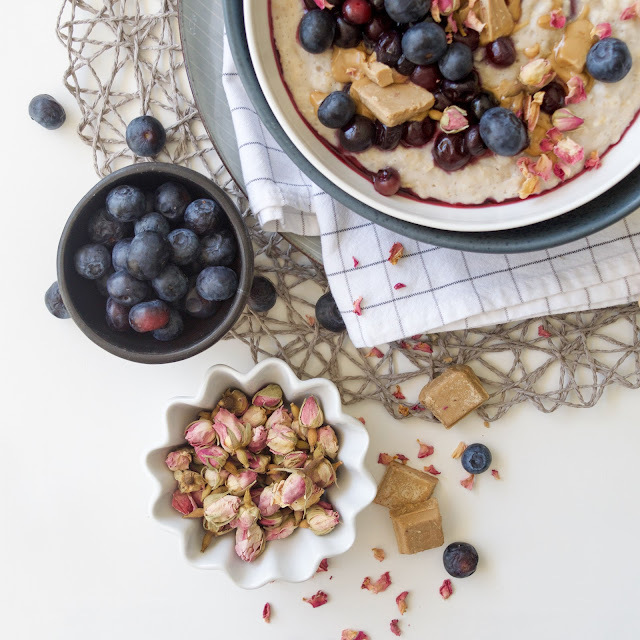 In a bowl, combine the oats, apple juice, oat milk, vanilla, brown sugar and cinnamon. Mix them around well to combine and then place in the fridge overnight. 2. 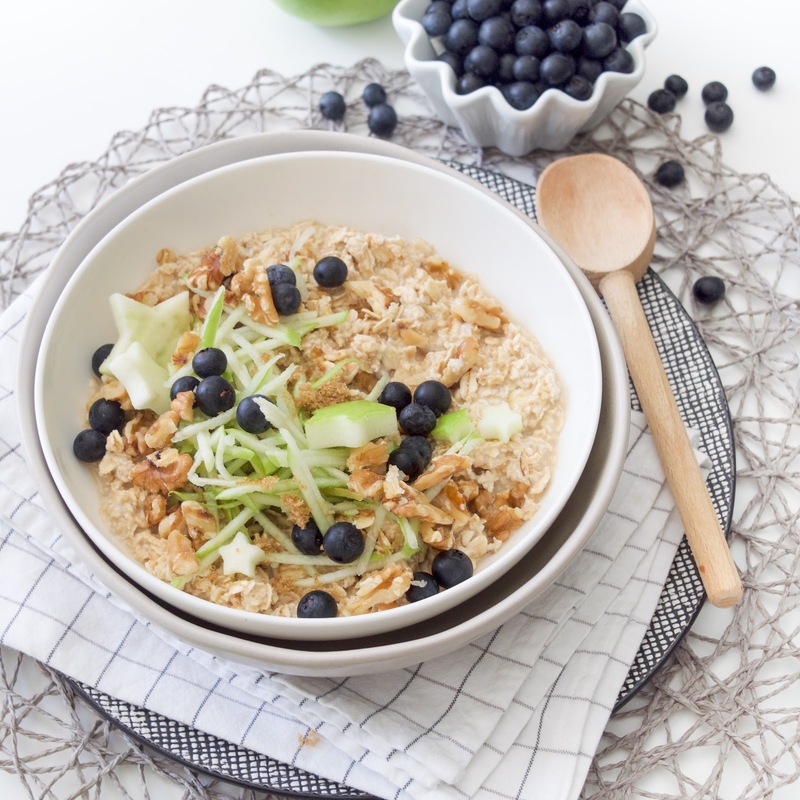 The following morning, take your oats out of the fridge and give them another good mix through. Add in the walnuts, blueberries and diced apple, again stirring everything through well. Serve immediately and enjoy! Roast Potato and Broccoli Soup with Crispy Salt and Pepper Tofu. I love broccoli. 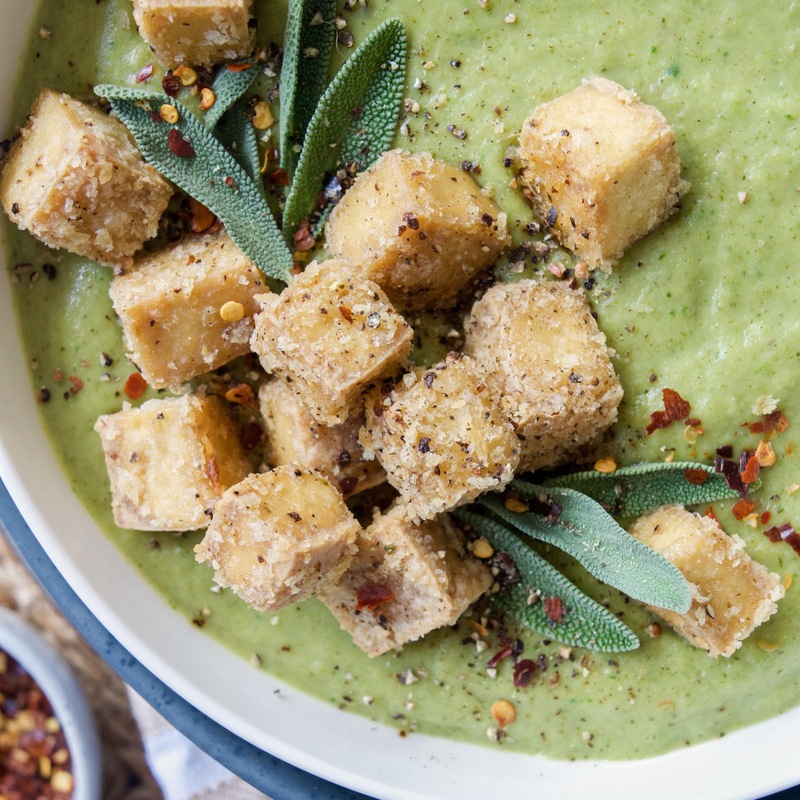 Like, I get that it's a bit of a controversial vegetable and I'm sure there's a decent number of you who read the title of this recipe and went 'nope nope NOPE' but guess what? 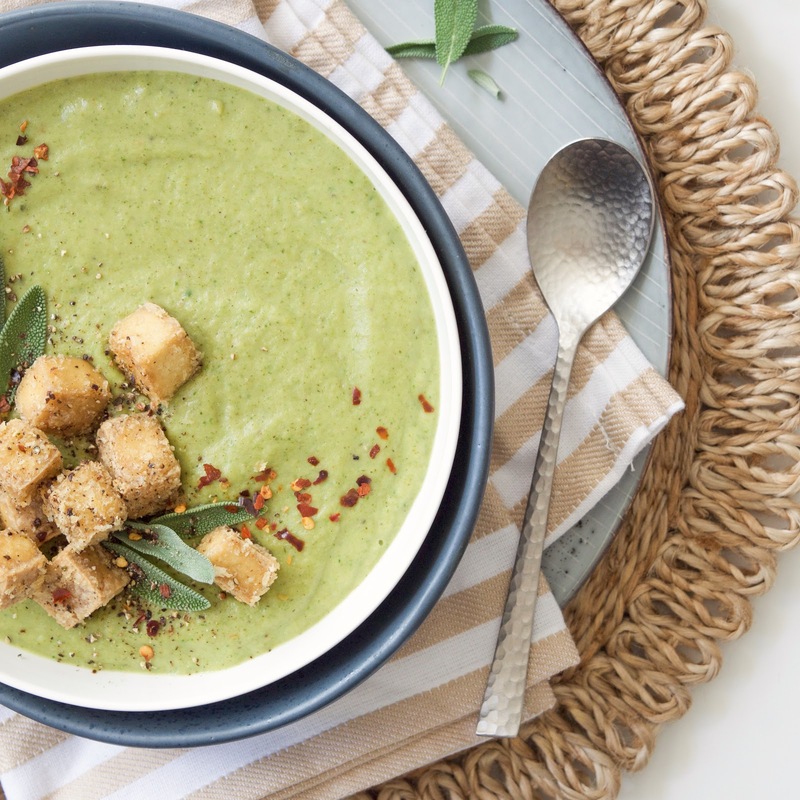 That's your loss because broccoli is, objectively speaking, the tastiest and this soup is a testament to that! Two days ago in Australia, it was summer. Today, we live in the depths of the Siberian winter. Very fun, thank you weather overlords. Anyways. The flow on effect of that wild weather change is that soup is back in season, which I guess is a pretty big positive to take out of the situation because soup is quite yum. I'm a long time fan of a very classic pumpkin soup, however I though this winter I should branch out and make some new types of soup. So, with that in mind, I thought I'd kick things off with a homage to my favourite vegetable - broccoli! 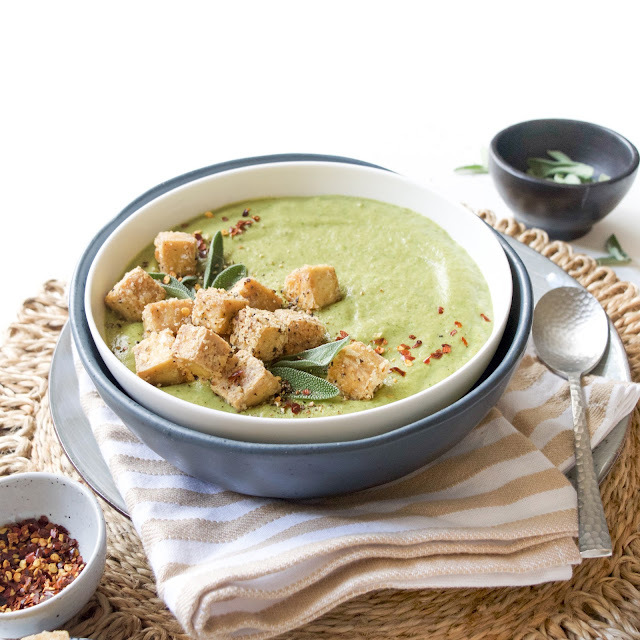 This soup is super easy to make - you only need one oven tray and a blender. Basically you roast everything which will make your house smell absolutely fantastic, and then you blend it (sans tofu) and voila! You're done! It's also LOADED with vegetables, which is amazing because eating your veggies is cool. Fact. 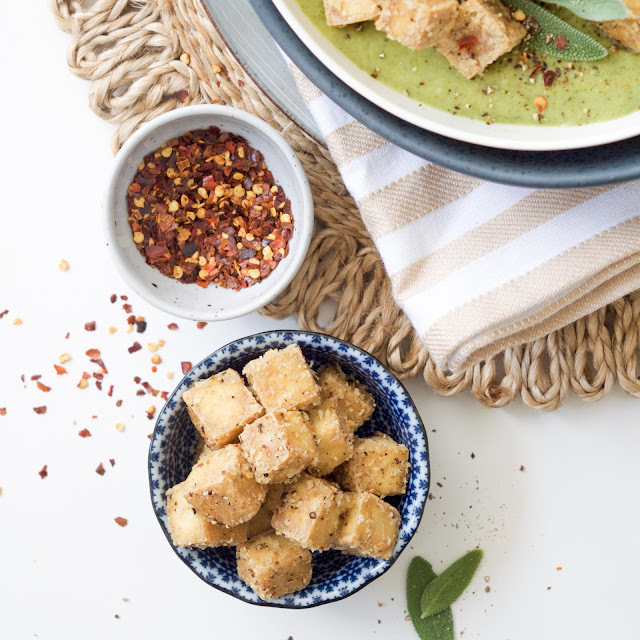 Now, moving on, we need to talk about the crispy salt and pepper tofu. This stuff is THE BUSINESS. Get round it my friends, cause this tofu will change your life! At the last minute before I put it in the oven it occurred to me that panko breadcrumbs would probably make the tofu crispier and therefore tastier and HOT DIDDLY DAMN that was an EPIPHANY! Life changing, I'm telling you! It took all my self restraint to not eat it all straight off the oven tray! But, that restraint was well worth it because on top of the soup, the tofu is, shockingly, even better! So crispy. SO GOOD! Make it now, put it on your soup, change your life. Easy peasy! 1. Preheat a fan-forced oven to 180 degrees Celsius. 2. Take a large oven tray and line it with baking paper/parchment. Put the diced potato, leek and onion on the tray, then season with salt and pepper to taste and olive oil. Mix everything through to make sure it's all got some olive oil on it for optimum oven roasting, then put that tray in the oven for 30 minutes. 3. Roughly chop the broccoli into florets. I also use the stalk, which I dice into cubes approx. 2cm square. 4. After 30 minutes, remove the tray from the oven and add the broccoli to the tray, mixing everything through together. Place back in the oven for a further 30 minutes. 5. While the vegetables are roasting, prepare the tofu. You will need to remove it from the packaging and pat it dry with some absorbent paper/paper towel. Then cut it into bit size cubes and put it in a bowl. Season with salt and pepper, then add in the cornflower. Mix the tofu around to make sure the pieces are coated in the cornflower, then add in the olive oil. Mix through again, and then add the panko breadcrumbs, giving the tofu one final mix through. 6. When the veggies are roasted, remove them from the oven and transfer them into a large blender. 7. Spread the tofu cubes out on the same baking tray that you roasted the vegetables on, then place in the oven (at the same temperature) and bake for 30 minutes. 8. Take the blender with the veggies in it and add the vegetable stock in. Blend on high speed for several minutes until the mixture is completely smooth and creamy. Add in the chilli flakes and the spinach, blend again for several minutes more. 9. 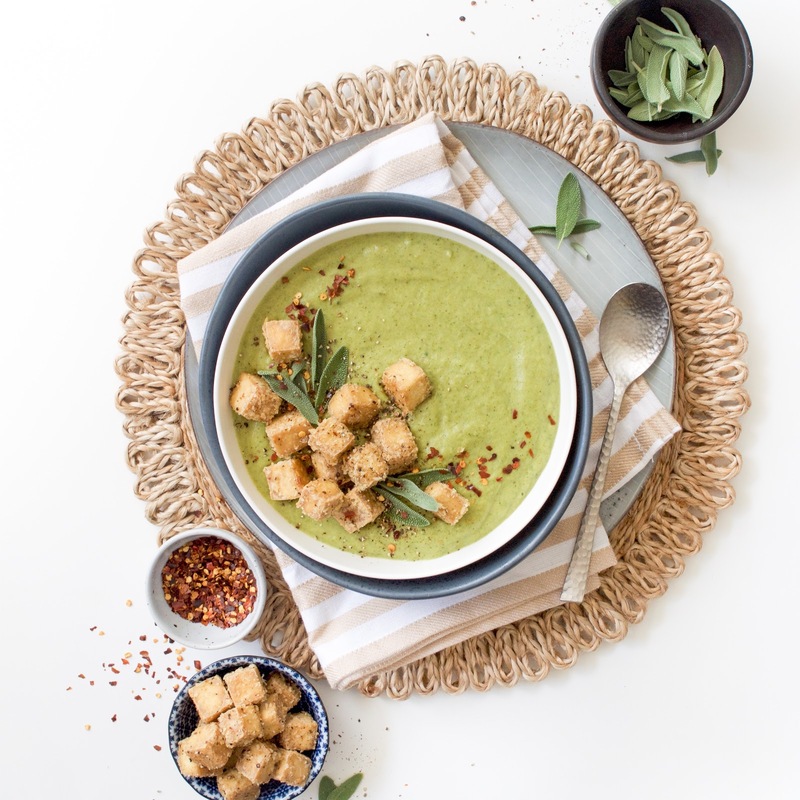 When the soup is blended and the tofu is cooked, serve up a bowl topped with the crispy salt and pepper tofu. I like to add a sprinkle of chilli flakes and cracked black pepper too, but that's entirely optional! Enjoy!!! 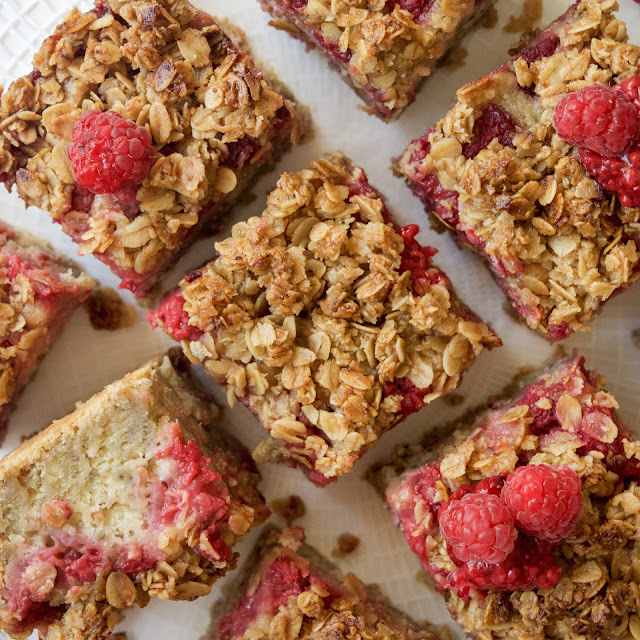 Raspberry, Cardamon and Oat Slice. 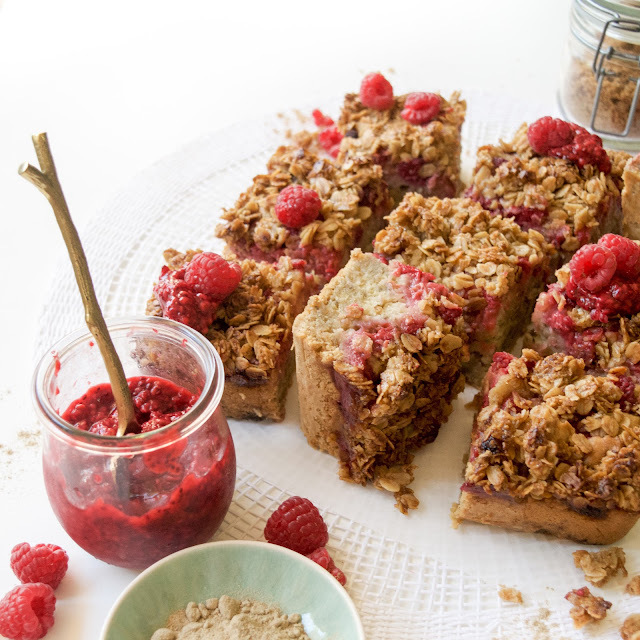 I have many strange kitchen dreams, one of which was to create a triple layer slice kinda thing that was part cake, part berry and part crumble. That probably sounds kinda weirdly specific, but the stomach wants what the stomach wants, so make such a thing I would. I first tried this triple layer slice thing out a few months ago and it was good, but like, it wasn't great and I dunno about you, but mediocre baked goods are very sad, so I kinda spent the following few months wallowing around at my semi-failed baking. This time was productive however, because I was simultaneously also thinking about how I was going to make the triple layer slice thing better. 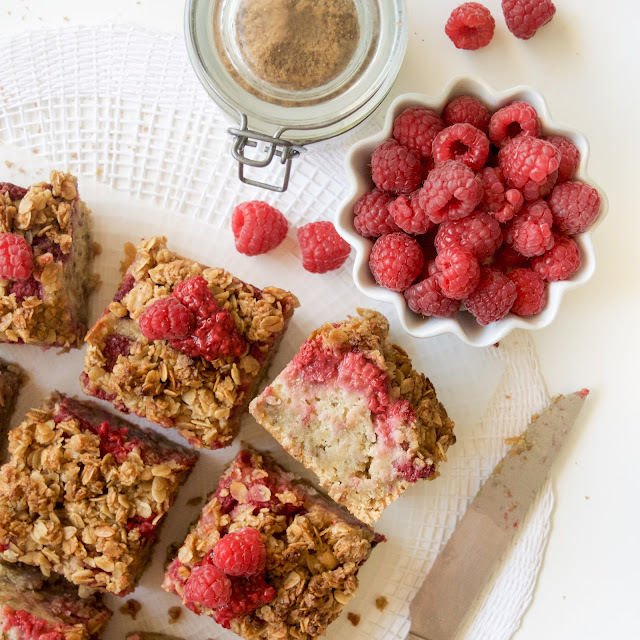 I'm proud to share that that thinking was fruitful (literally), because I gift unto the world today this Raspberry, Cardamon and Oat Slice that is VERY tasty and VERY much a baking success and I am VERY happy about it alright!! As it turns out, my stomach was well and proper onto something when it decided this weird part cake, part berry and part crumble thing. 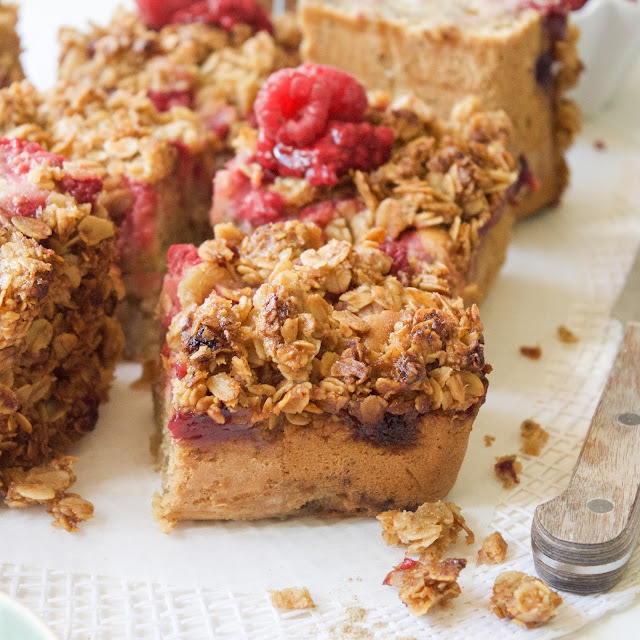 It's kinda like, all the very best of those things rolled into this delicious slice that's embarrassingly easy to eat more than one slice of... 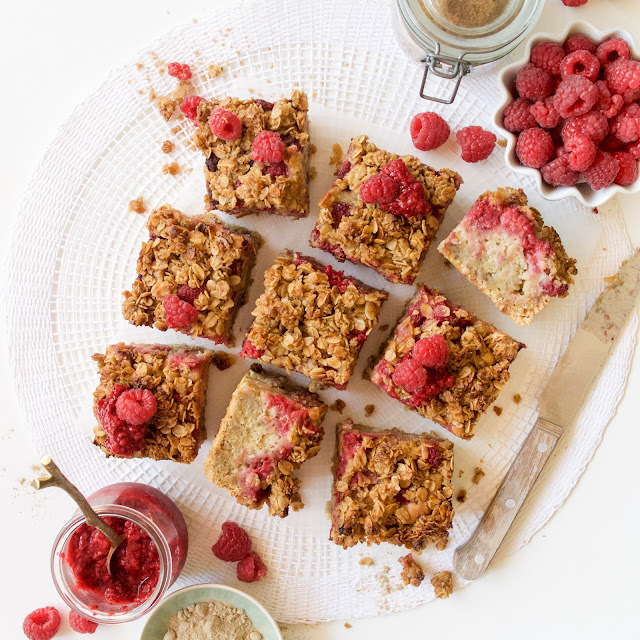 The cake is light and fluffy and subtly yet very tastefully flavoured with vanilla and cardamon, the berries kinda stew and go all delightfully gooey in the oven which is mindblowingly goooooooood and then the crumble - well the crumble is literally oats, brown sugar and butter, need I say more?! 1. Preheat a fan-forced oven to 180 degrees Celsius and line a square cake tin with parchment paper/baking paper. 2. In a large mixing bowl, place the 125gm vegan butter, white sugar and vanilla. Using an electric mixer, combine those three ingredients on high speed until they're all mixed together, thick and deliciously creamy. 3. Add in your chia egg, cardamon, plain flour, baking soda, bicarb soda and plant milk, then mix together using the electric mixer until you have a completely smooth cake batter. 4. Place the cake mix to the side for a moment to prepare the oat crumble that goes on top. In a smaller mixing bowl, add the rolled oats, brown sugar and 2 tbsp vegan butter. Use your hands to mix the crumble together, kinda of like, rolling the butter together in your fingers to break it up and mix it through the oats and sugar. You should end up with a mixture that would roll into a ball and hold it's shape if you were to try (but like, don't try that because we don't want oat balls, we want oat crumble)! 5. Take your lined cake tin and pour the cake batter into the bottom, spreading it over the dish evenly. Then add the 2 cups of raspberries over the top, making sure they're spread relatively evenly over the cake batter. 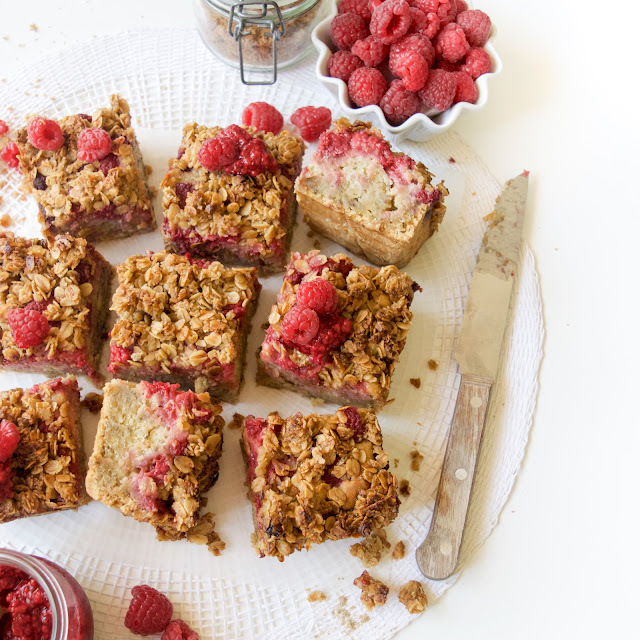 Finally, sprinkle the oat crumble over the top - you should still be able to see some of the raspberries through the crumble, we are going for a rustic vibe here after all! 6. Place the triple layer (!!!) slice in the oven and allow to bake for 45 minutes. By that stage the crumble should be fairly well browned, so cover with some foil and then return to the oven for a further 30 minutes of baking away (this last 30 minutes is basically to cook the centre of the slice). 7. After an hour and 15 mins (approx. ), the slice should be cooked, so remove it from the oven and allow to cool. 8. When the cake is cooled, cut it into slices and then eat your damn heart out on this bad boy. Happy days!! Blackberry and Banana Protein Smoothie. I'm not particularly great at making something, photographing it and then quickly get it up on this blog. In actual fact, I have an enormous backlog of pictures sitting on my computer waiting to be typed up into a recipe and uploaded here. Today however, I'm going to break my procrastinating ways and get this recipe out onto the interwebs because it's so insanely quick to make, ridiculously easy, tastes amazing and I kind really love the pictures I managed to take earlier today. 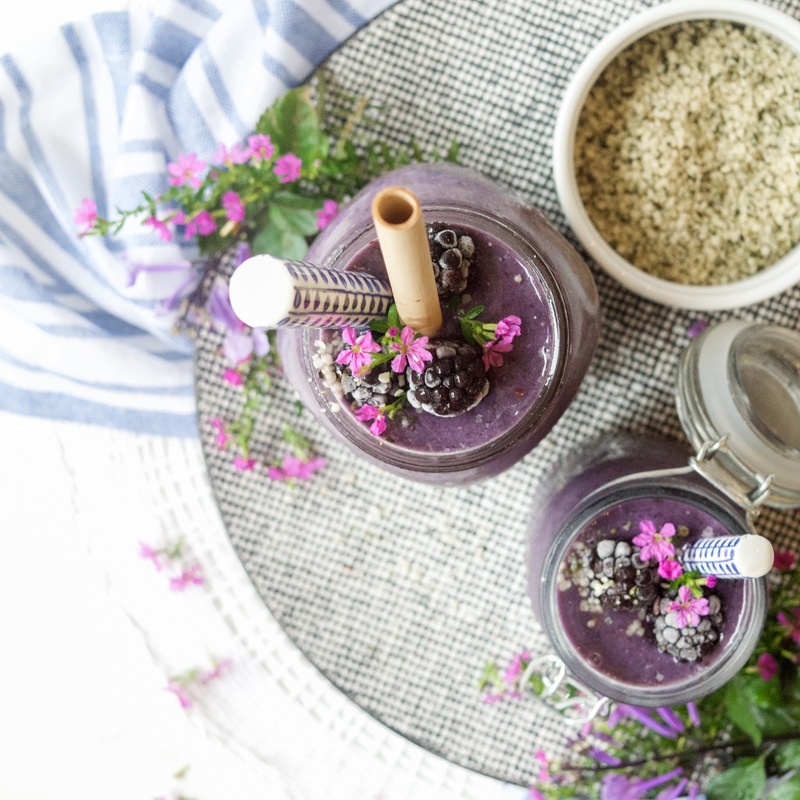 It's been a while since I shared a smoothie recipe because I kinda felt like a bit of a cheat calling a smoothie a 'recipe'. Like, let's be honest, putting a handful of very simple ingredients in a blender isn't precisely what you'd call cooking, and I kinda assumed people sorta just freestyled it like I do when it comes to smoothie making. 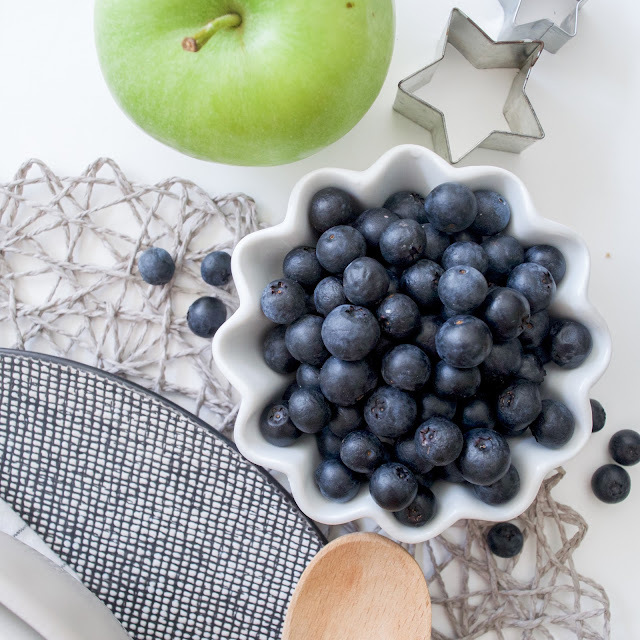 However, smoothie combinations and measurements, so basically recipes, is something I frequently get asked about on Instagram and from my friends in real life too. So, I guess you guys do want to see more of these quick and easy recipes that only have a few ingredients. I aim to please, so here you go!!! 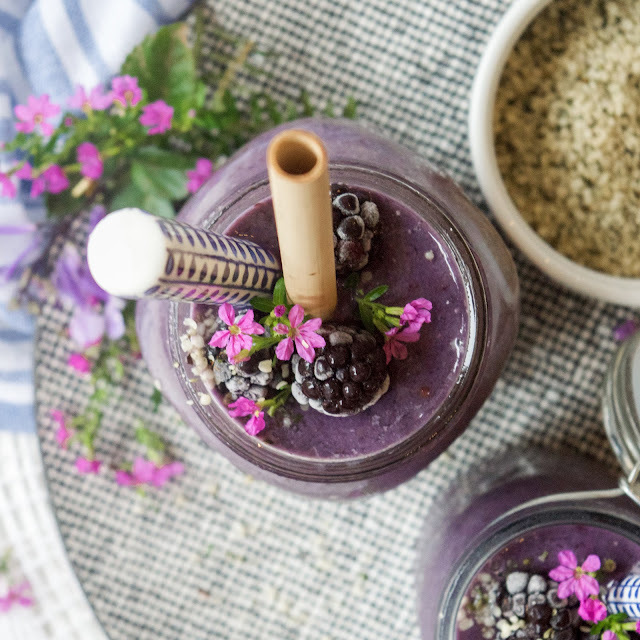 The secret and highly underrated ingredient in this smoothie is hemp seeds. Once a super alternative, hard-to-find health food, these days you can get hemp seeds in mainstream supermarkets! They're absolutely loaded with protein so I've been trying to incorporate them into my diet more (vegan protein gains amiright?!). They don't have a strong flavour, which I love and they're super easy to chunk into a blender along with some fruit and plant milk, which will take a regular tasty smoothie to a protein loaded tasty smoothie perfect to start you day with! 1. 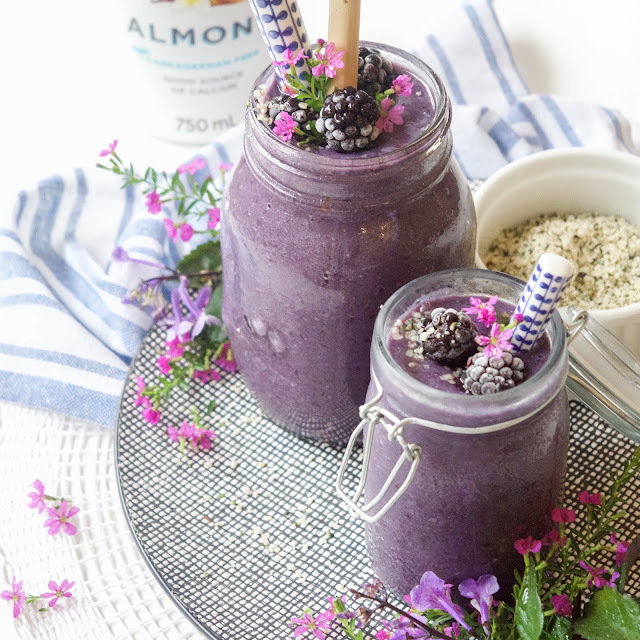 Place all the ingredients in a blender and mix on high speed until they're thick and deliciously smooth! I use a blender with a tamper stick, which I would 100% recommend, but if you don't have one, just scrape the sides down a few times and make sure that the banana is fully blended and there aren't any unwanted banana chunks! 2. Serve immediately, topped off with a sprinkle of hemp seeds. Enjoy! 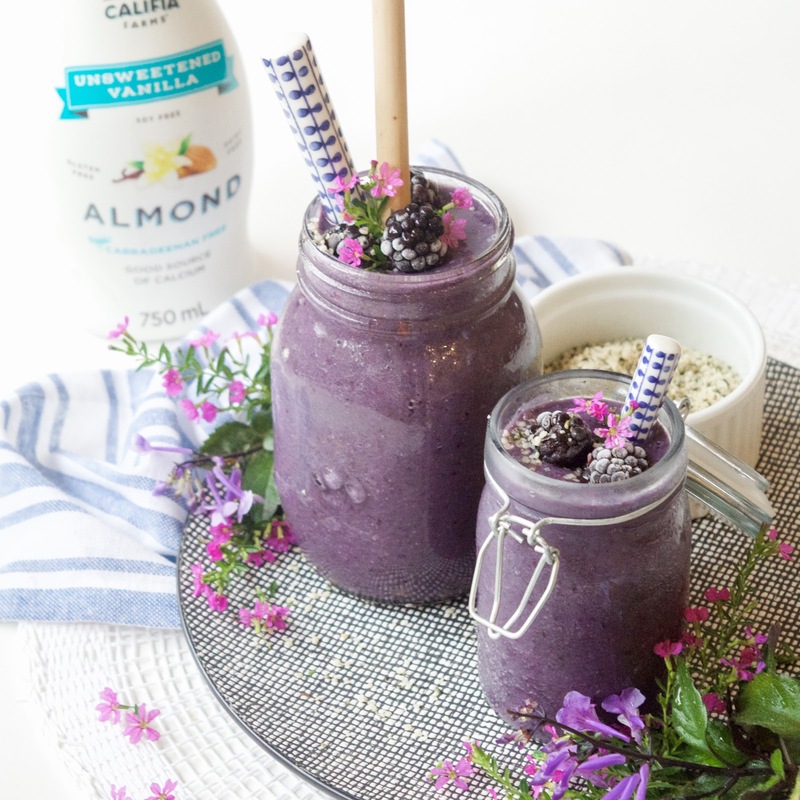 This post was created using product kindly gifted to me by Califia Farms, however my opinions, words and this recipe are, as always, proudly my own! I've recently been to Japan which was very fun and very exciting. The purpose of my trip was to go snowboarding and quite frankly, I had the time of my life. I haven't been snowboarding for very long, so I'm still a bit of a noob, but I genuinely think it is the most fun thing someone could do with their time and I now like to spend all my time and money that I can on heading to the mountains and getting better at riding. This is a somewhat tricky thing to do in Australia because while we do have mountains that get snow in the winter, our snow season is notoriously fickle so there's no guarantee you'll have good riding conditions. We also don't have very many snow resorts, nor do I, like most Aussies, live particularly close to any of those resorts, which basically lots of Australians, myself now included, like to take off overseas chasing the snow. Hence the trip to Japan. While snow was the purpose of my trip to Japan, the food also deserves a very honourable mention. Weirdly I have very little exposure to Japanese food, so I kinda didn't know what to expect. In actual fact, I had been warned that as a vegan, navigating the food scene in Japan would supposedly be very difficult. While I definitely had to do my research, I was very pleasantly surprised by how much Japanese food I could eat and also how damn tasty it was!!! We're talking ramen, soba noodles, udon noodle soup, some more ramen, and even some okonomiyaki (a kind of savoury pancake) that my lovely friend made especially for me because typically they're not vegan. Long story short, I ate well while I was in Japan and I came home feeling very inspired by Japanese cuisine! While I didn't actually eat any of these in Japan, gyozas are a traditional Japanese dumplings and they are the bomb.com. 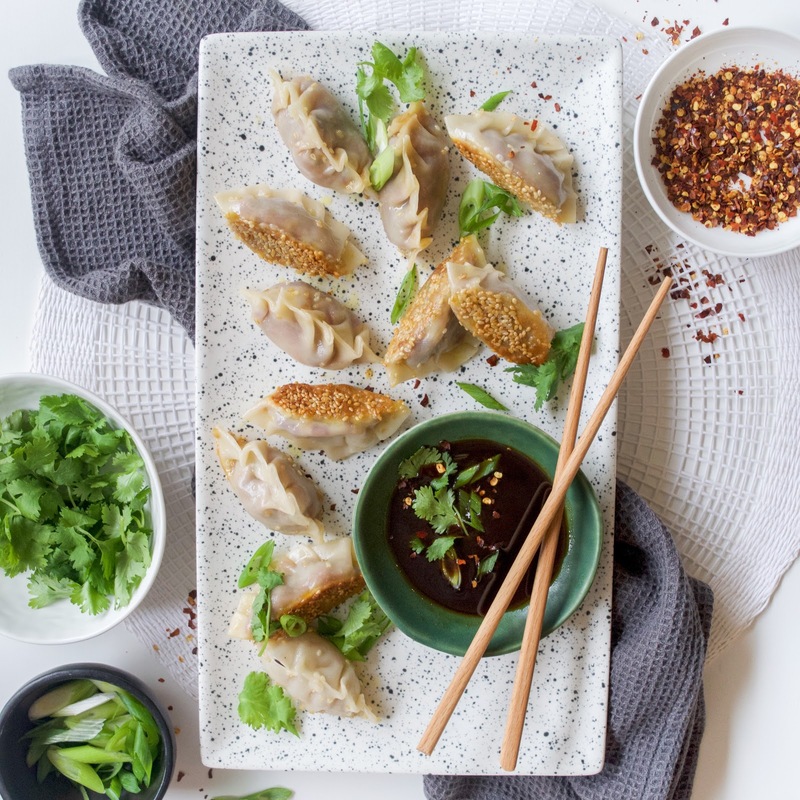 I have experimented with a similar recipe before, my Tofu, Water Chestnut and Thai Basil Potstickers, (which are also delicious - would recommend making) but these particular dumplings are particularly special courtesy of the sesame crusted bottoms on each dumpling. 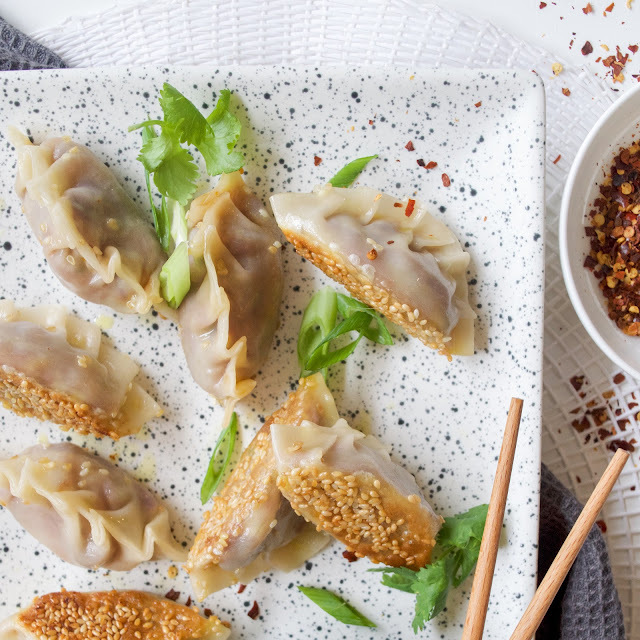 When cooked, the sesame seeds go super crunchy and add in the most delightful flavour to the veggie gyozas. Honestly, I'm going to sesame coat all things that go in the frypan in my kitchen now because major yum! 1. Take a large frypan over medium/high heat and add some sesame seed oil to it. Add in the diced onion, celery plus the minced garlic and ginger, stirring well. Cook for a few minutes until the onion starts to lightly brown. 2. Add in the grated carrot, plus the finely sliced cabbage and wombok. Mix through well, then place a lid over the pan for a couple of minutes. 3. Add in the soy sauce and the chilli flakes, again mixing everything through well. Allow to cook for a few minutes more then remove from the heat and allow to cool. 4. To make the gyozas, spoon 1 tsp (approx.) 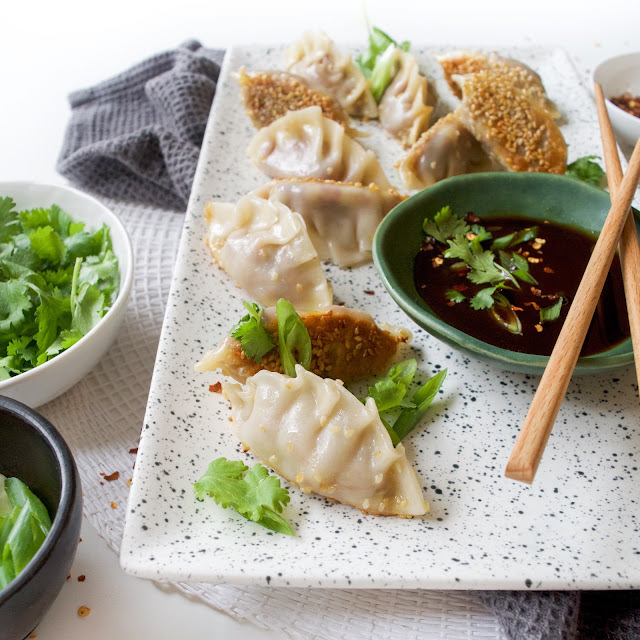 of the veggie mixture into the centre of each dumpling wrapper. Brush water around the edge of half the wrapper (I just use my finger dipped into a small bowl of water to do this). Fold the wrapper in half, then pinch the edges together to seal. For added pizzaz, when pressing the edges together slightly gather one side of the wrapper to create a small pleat of fold in the dumpling. Repeat the process with all the remaining wrappers. 5. Add the sesame seeds to a shallow bowl. After you've used all your filling and made all the gyozas, take them one at a time and brush a little bit of water on the bottom. Then press the bottom of each gyoza in the sesame seeds to coat the bottom of the gyoza. 6. Add some sesame seed oil to a clean frypan over medium/high heat (make sure the frypan has a matching lid - this is SUPER important because you need to cook and then steam them in the one pan). 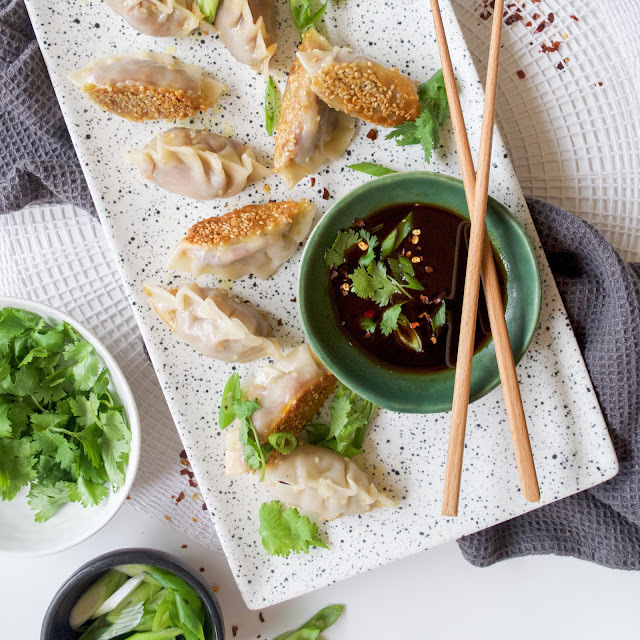 Add each gyoza to the pan and allow to cook till the bottoms are browned and the sesame seeds are golden and crunchy - this should take a few minutes. Add 1/4 cup water to the pan and immediately cover with the lid, allowing the gyozas to cook for a further 5 minutes. 7. 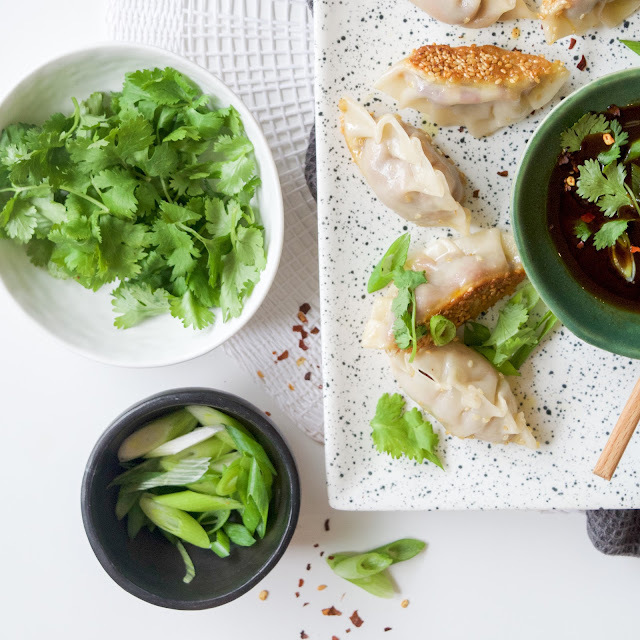 To make your dipping sauce, mix together the hoisin and soy in a small bowl. 8. 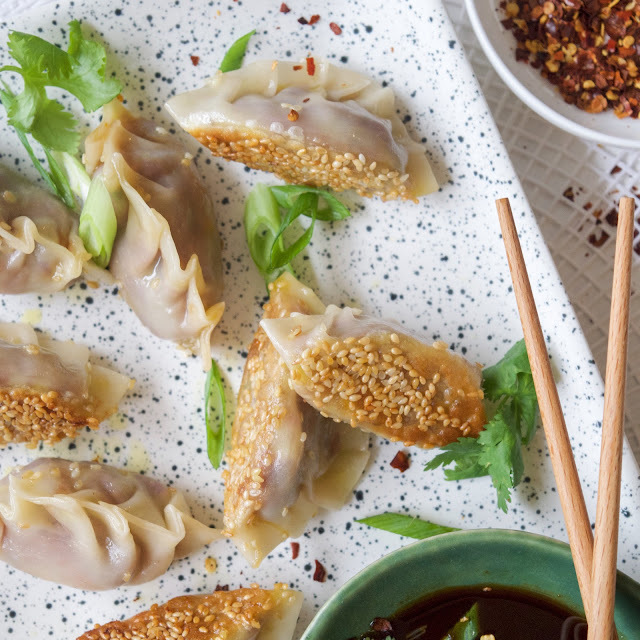 Serve the gyozas immediately after they've cooked. I like to add a sprinkling of finely diced spring onions and coriander over the top but that's just me being extra and is entirely optional! Enjoy!! 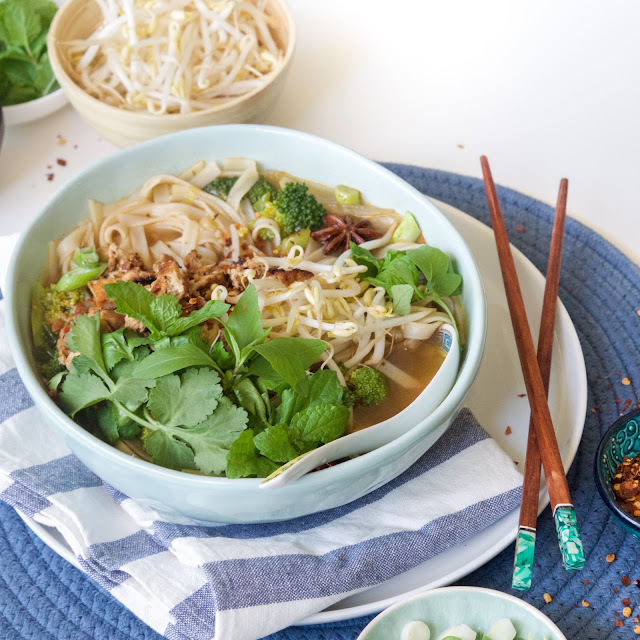 Quick and Easy Vegan Pho. This recipe has been a LONG time coming. Apologies for the unjustifiably long delay (I've been working on it since 2014! ), but on the bright side, I'm happy to share that the end result of all that time recipe testing is this super quick, super easy and SUPER delicious pho! They say good things come to those who wait, and in this instance, hot damn does that saying ring true! Despite still not being entirely certain how to pronounce the name of this dish (is it "fuh" or is it "fo"???! ), it is nonetheless one of my favourite foods ever! I first discovered the wonders of pho when on a trip to southern Vietnam in 2014 and I very quickly fell in love. The sad news though, is that typically pho is made using a bone broth which is clearly very not vegan friendly and also kind gross. Anyways. I returned home and set out to make a veggie loaded vegan version of this wonderful Vietnamese noodle soup dish and five short years later, I'm happy to finally deliver the goods. The secret to a good pho is a good broth, and the secret to a good broth is good spices. 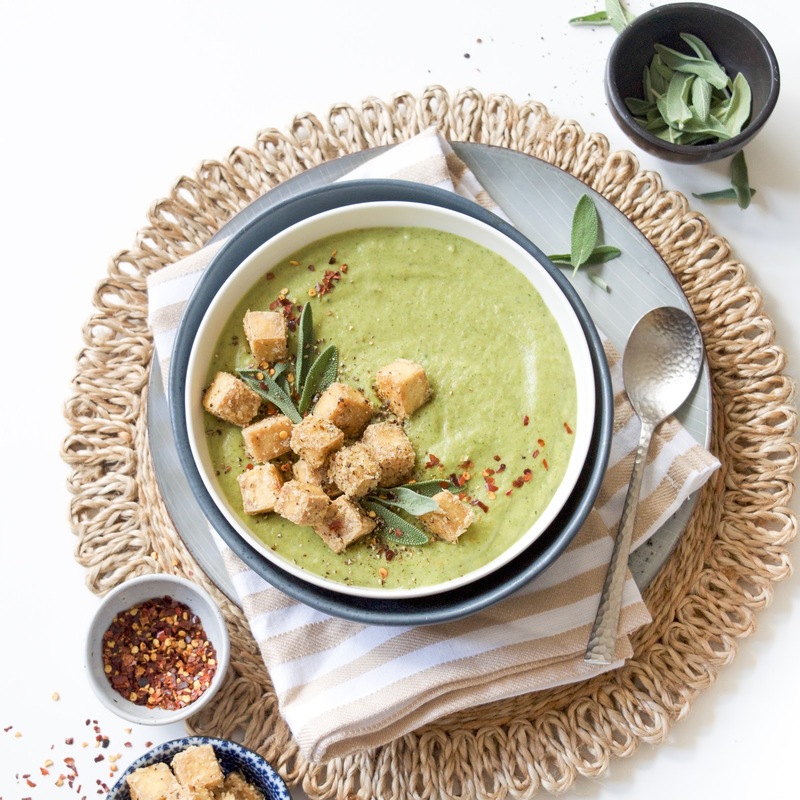 Perhaps somewhat surprisingly, the two stars of the show are star anise and cinnamon, both of which give this broth a really intense depth of flavour and quite frankly, make the dish. I've never used star anise for anything else in the kitchen and truthfully I'm not entirely sure what what one do with it aside from make pho broth but the good news is that it is widely available (I got some from one of the main supermarket's here in Australia for just a few dollars) - a big plus because normally quirky spices like that are hard to source and ludicrously expense. 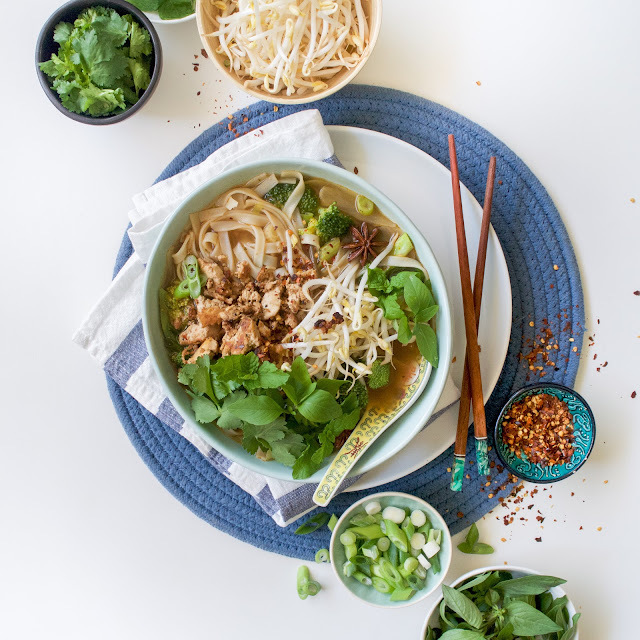 Aside from being vegetable based, this pho differs from the traditional ones in that the broth will not take you hours to make and brew. In actual fact, I've been making this pho for the last week every second day (I'm obsessed with it) and while I've never timed myself, I guesstimate that it takes me about 30 minutes from start to finish! 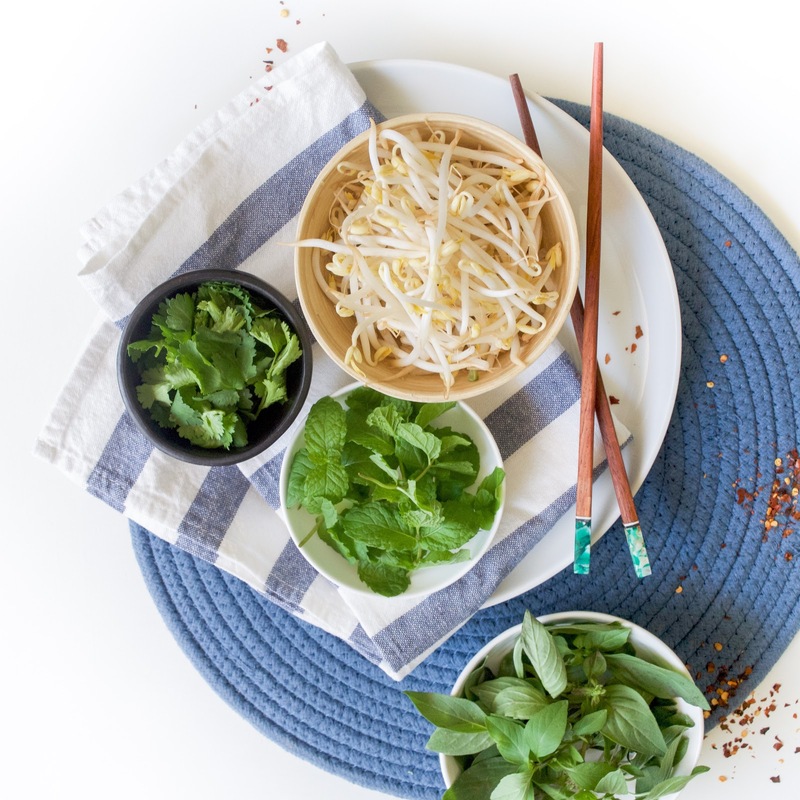 Before leaving you with the recipe, one final word of advice - use fresh herbs VERY generously to top off your pho. As with most things I eat, I use a ridiculous amount of herbs which isn't always to everyone's liking, but trust me, on this pho, ALL OF THE HERBS. 1. In a large pot over high heat (make sure it's big enough to hold 2 litres of water minimum), add a splash of sesame seed oil, then add in the onion. Cook the onion for a few minutes until it starts to lightly brown. 2. Add in the spices to your pot (cinnamon, star anise, chilli flakes, garlic and ginger) and mix around the pot with the onions for a minute or so (the smell at this stage will be magnificent, appreciate it!). 3. Turn the heat down to medium/low, then add in the water and stock cubes (or veggie stock, depending on which you're using) and soy sauce/tamari, stir and place the lid on to allow that to cook a little. 4. Place a fry pan over medium/high heat. Add in the sesame seed oil, crumbled tofu, soy sauce/tamari, hoisin, chilli flakes and pepper, then stir well. Keep stirring this every few minutes - you'll know the tofu is cooked when it starts to brown, which should take 10 minutes or so. 5. By this stage the broth should be simmering - add in the broccoli florets and rice noodles, stir through and place the lid back on. Keep an eye on this pot, stirring occasionally until your noodles are cooked which may vary depending on the thickness of the noodles you use, but typically takes a few minutes. 6. When the noodles and the tofu are both cooked, remove from the heat. 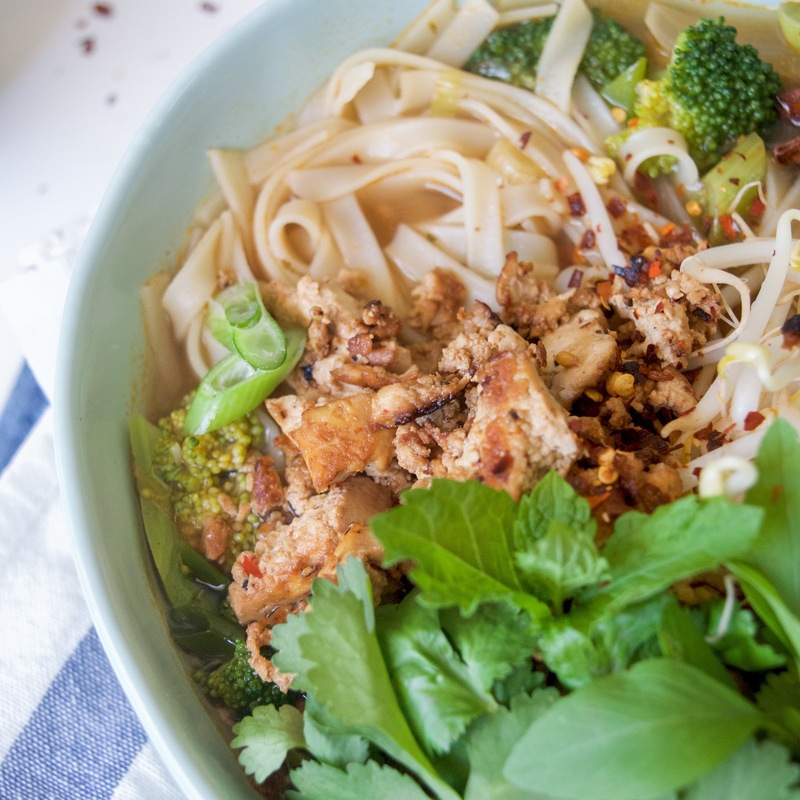 Take some bowls (would suggest a relatively deep one) and pour/scoop some noodles, broth and broccoli in each. 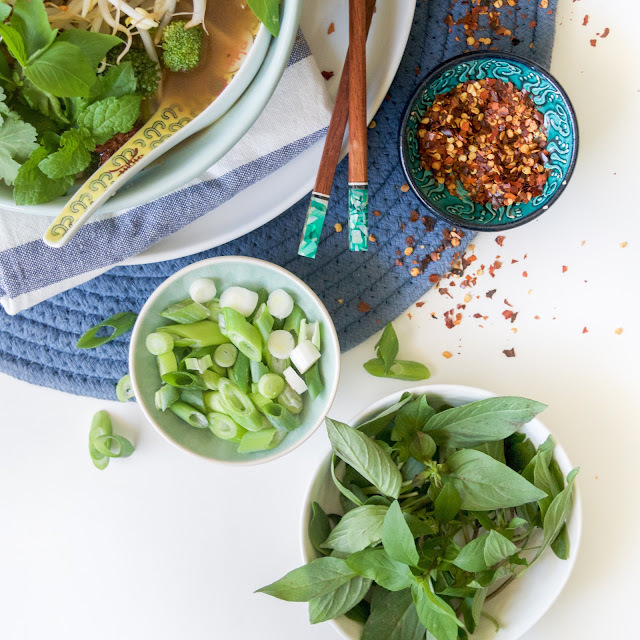 Add some of the tofu on top, along with a generous handful of bean shoots and some fresh Vietnamese basil, coriander and mint leaves and voila, you have yourself the most delicious bowl of pho ever! HAPPY DAYS! 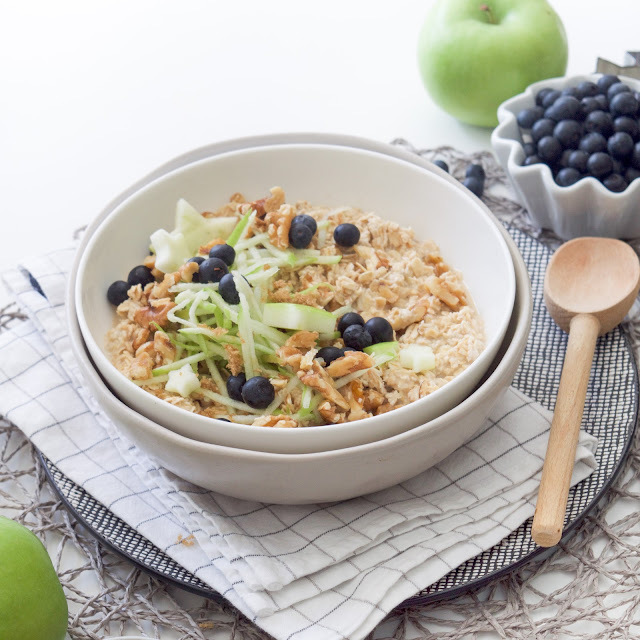 Porridge is a staple breakfast in many homes across the world, but alas not mine. Don't ask me why, because there is genuinely no proper reason to explain this, but I was at least 22 years old before I ate my first bowl of porridge (that I can remember at least). Safe to say that having now having discovered the wonders of porridge for breakfast, I AM FEELING CHEATED! I want to time travel, go back to the days of 'yo, what in the heck should I eat for breakfast because there are. no. good. BREAKFAST FOODS' and rain down the enlightenment of porridge all over my breakfast-needing soul. Like, we've never talked about this before because it's a deep dark secret from the depths of my past life, but there was a time I hated breakfast. I'd skip it and say mean things about breakfast and let's just say, breakfast and I were not friends, not at all. I now know why - I had no porridge! Fast forward to today and my life is a much happier place, mostly because I am now friends with breakfast. The sun shines a little brighter, the birds are chirping, et al, and I am feeling well and proper nourished because I just ate a giant bowl of this very porridge for breakfast and you damn well bet I feel like health and wellness and every ounce of wholesome living that exists on this earth is radiating out of every fibre of my being. This porridge is full of all that quality long-lasting energy courtesy of the oats, is flavoured to perfection with vanilla and rose and is topped off with juicy stewed blueberries and long story short, through this bowl, I have reached peak breakfast goals. It's everything you want to wake up to in the morning and more. 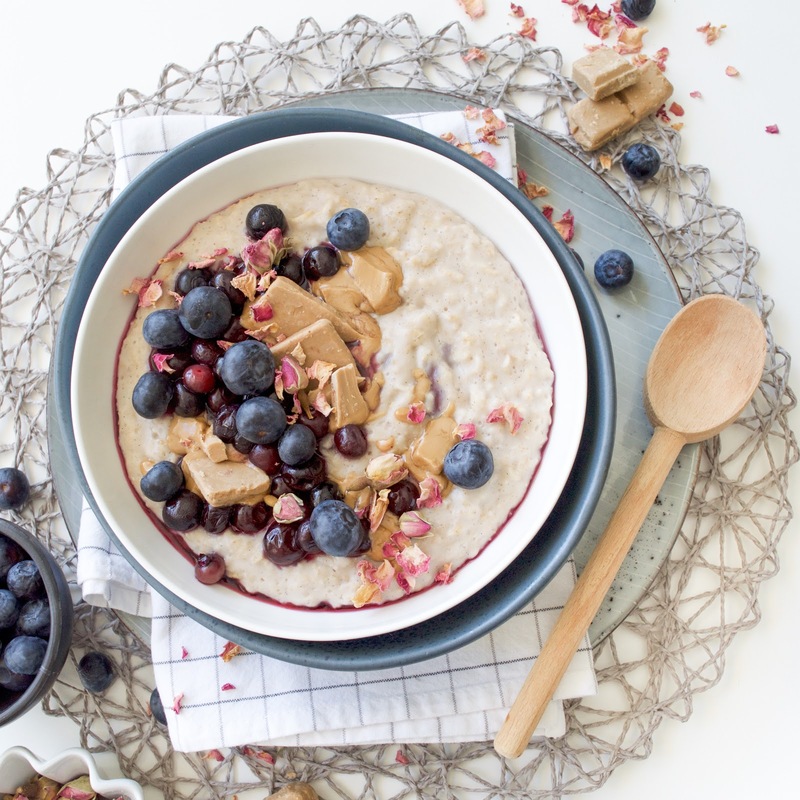 Make it for your breakfast now, revolutionise your life and, most importantly, though we may be new friends, I think you're the bomb.com porridge!!! 1. 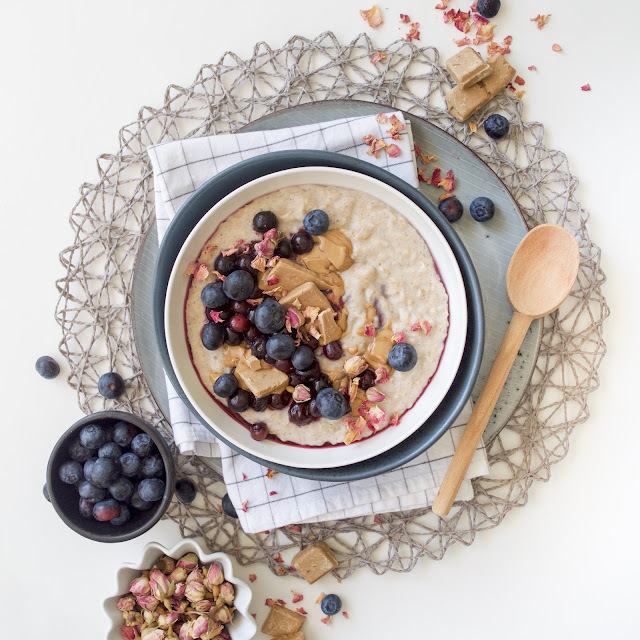 Take a medium saucepan on medium heat and add the rolled oats, almond milk, rose tea and vanilla bean paste to it. 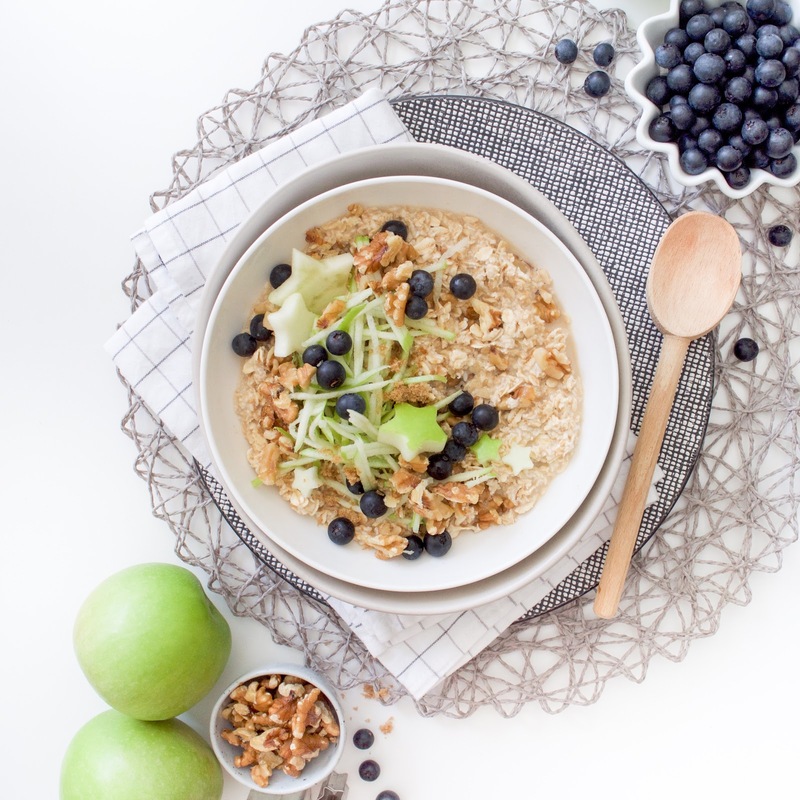 Stir through well and allow to heat up, stirring consistently till all the liquid is absorbed into the oats and it reaches your desired consistency. 2. 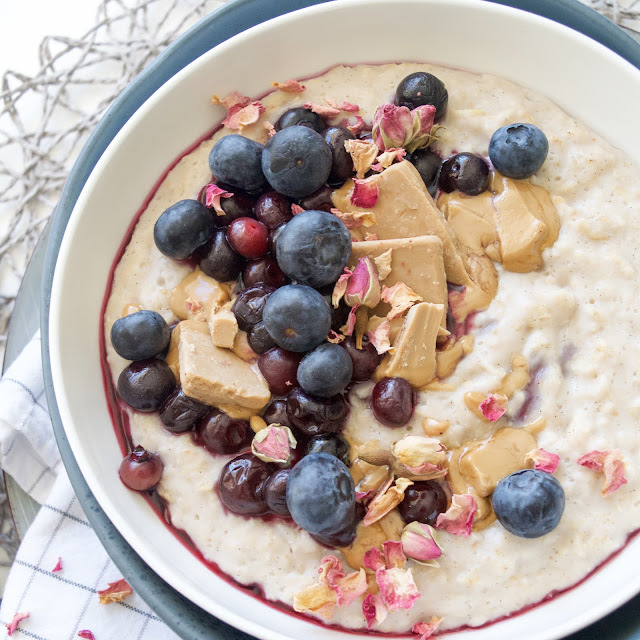 While the porridge is cooking, in a small saucepan add in the blueberries plus a tiny splash of water and heat them up - they'll taste divine on the top of your delicious rose flavoured porridge!!! 3. When your porridge is cooked, scoop it out into a bowl, top with the stewed blueberries, add on some dried rose petals for extra pizzaz plus some vegan chocolate for good measure and hot diddly DAMN have you got yourself a WICKED breakfast!! 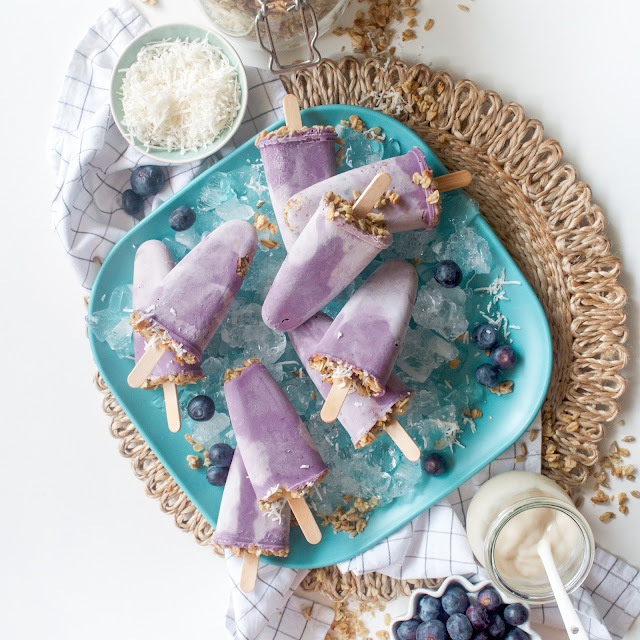 We've been having a VERY hot summer in Australia, which is kinda nice to be honest because hot weather is also ice cream/popsicle weather, and lemme tell you - I LOVE ICE CREAM! A few weeks ago I made my first proper cheesecake - one that has vegan cream cheese as the base ingredient and as it so turns out, that cheesecake was/is/will always be the BOMB.COM because hot damn does it taste good. I must confess however, that until fairly recently, I didn't realise that the crucial ingredient to that magical cheesecake, vegan cream cheese, was a thing. Delightfully, it is most definitely a thing and it's every bit as creamy and delicious as you might imagine. The best news though, is that it's available across Australia in most regular supermarkets. It's super satisfying/great/WOW to see veganism and vegan products become more widely available and not just some random weird diet and lifestyle that people choose to follow. It's even better however, that I myself can now easily obtain such vegan products because it means I get to make things like actual cheesecake and have really yum things in my life! While inspired by the cheesecake I created a few weeks back these Blueberry Cheesecake Popsicles are also distinctly unique courtesy of the blueberries. 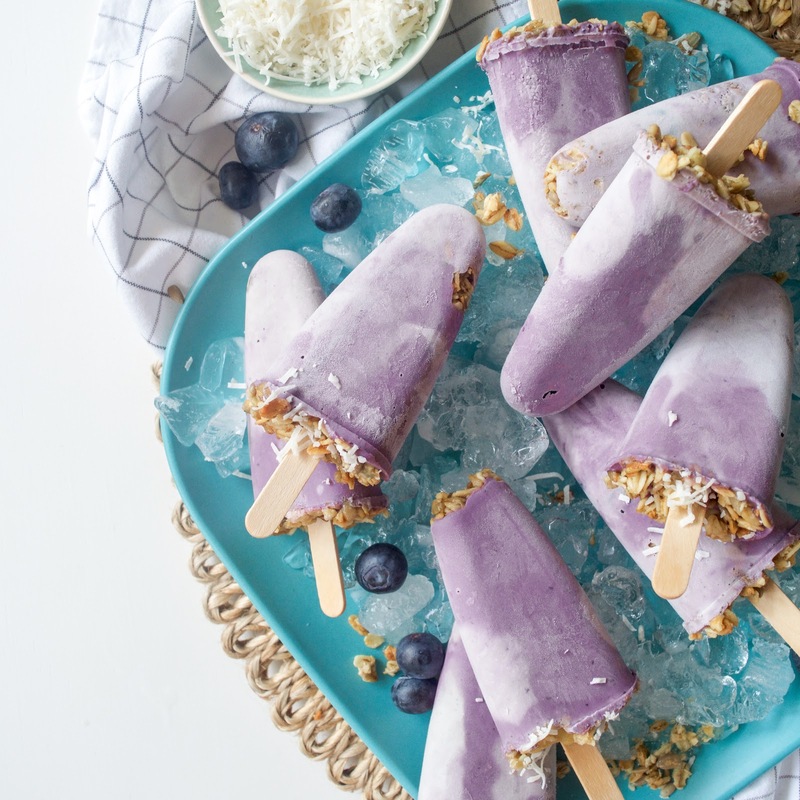 Aside from making them a decadent purple colour, the blueberries add a really fun berry flavour to the magical cheesecake mixture and long story short, you end up with some major deliciousness! 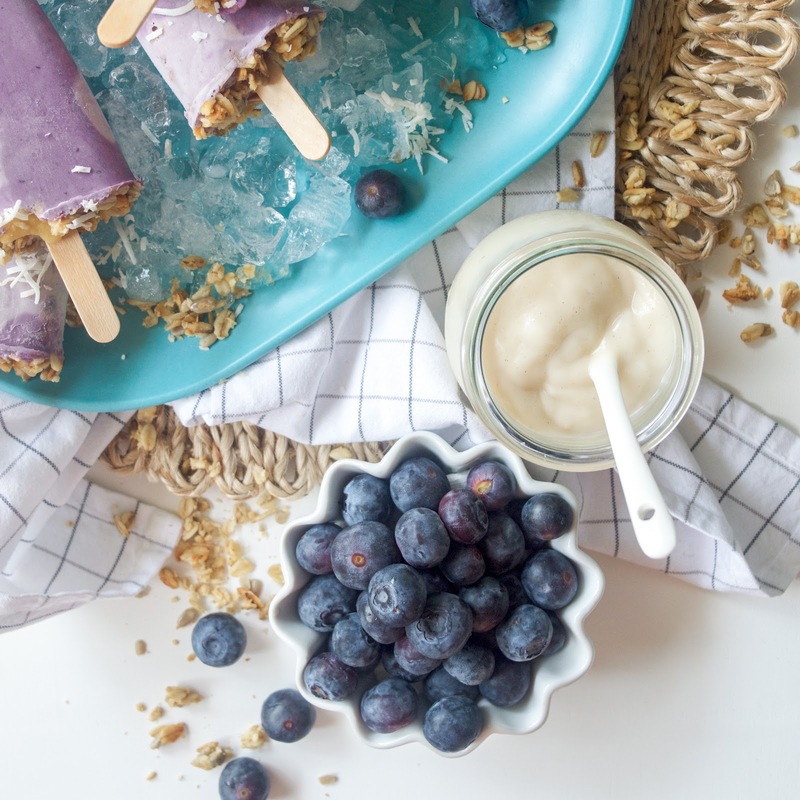 Sprinkled with some granola, these popsicles have quickly become my summertime go-to dessert and yeah look I guess you probably could say that you need some in your life too! 2. 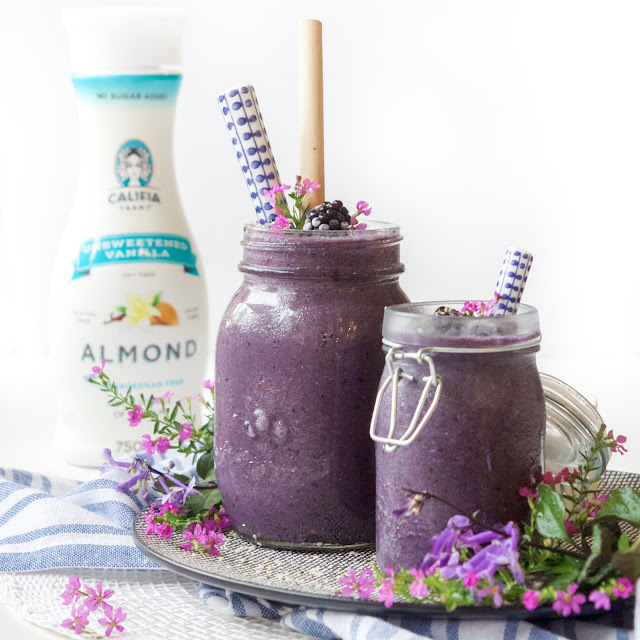 Place the cream cheese, soaked cashews, coconut cream, vanilla, maple syrup and blueberries in a blender. Blend on medium-high speed until you have a completely smooth mixture (no grittiness from the cashews is the key thing to look out for!). 3. 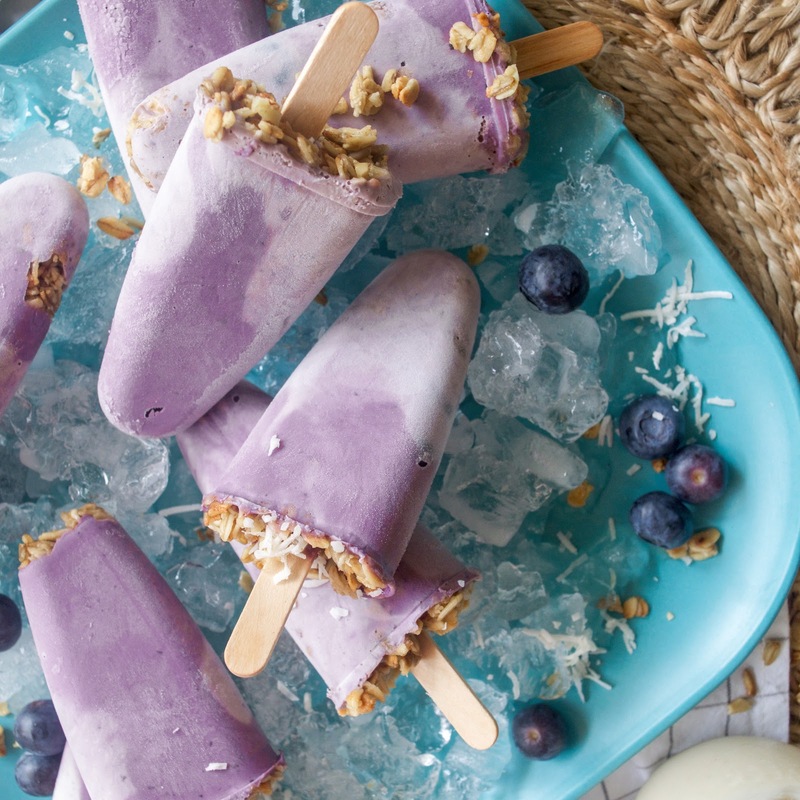 Split half the blueberry mixture into a small bowl and add in the coconut yoghurt. Swirl them through gently, not quite fulling mixing them together - they'll look particularly cool if they are two-toned when you pull them out of the moulds. 4. 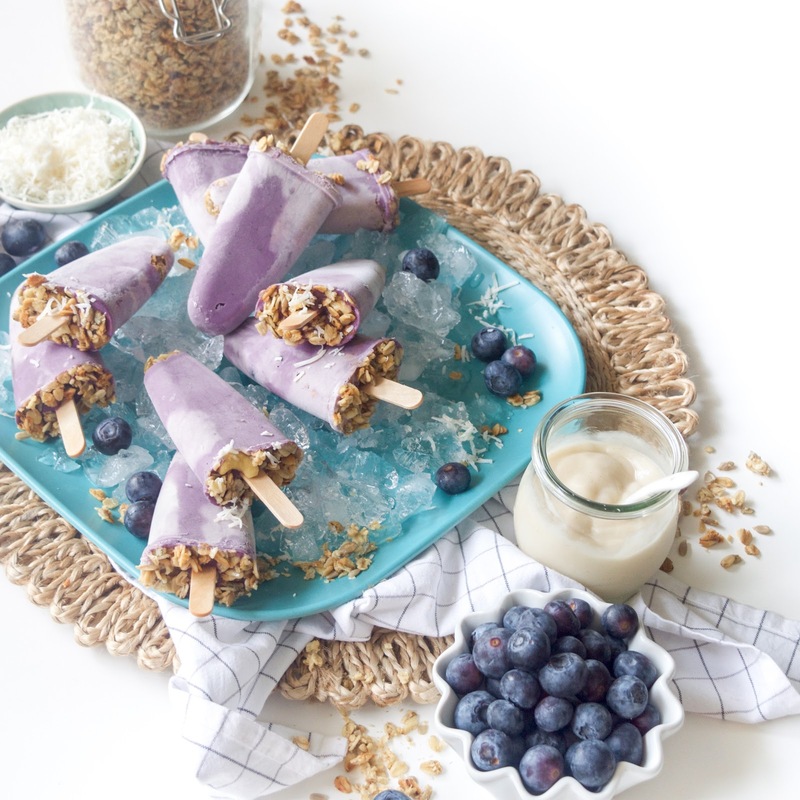 Take some popsicle moulds and scoop some of the plain blueberry mixture in, the some of the mixture with the coconut yoghurt, plus a little granola. Repeat until you've filled up all the moulds. 6. 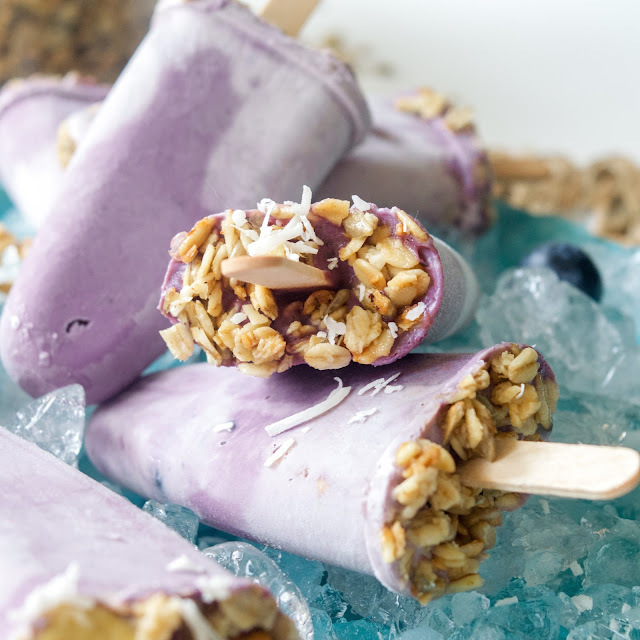 Place in the freezer overnight and the following day, enjoy the fruits of your handiwork!!! I'm really into muffins right now. They're fun to bake, they're even more fun to eat and they're also really good (as in like, REALLY LEGIT, hit the spot kinda good) for a mid-morning pick me up! 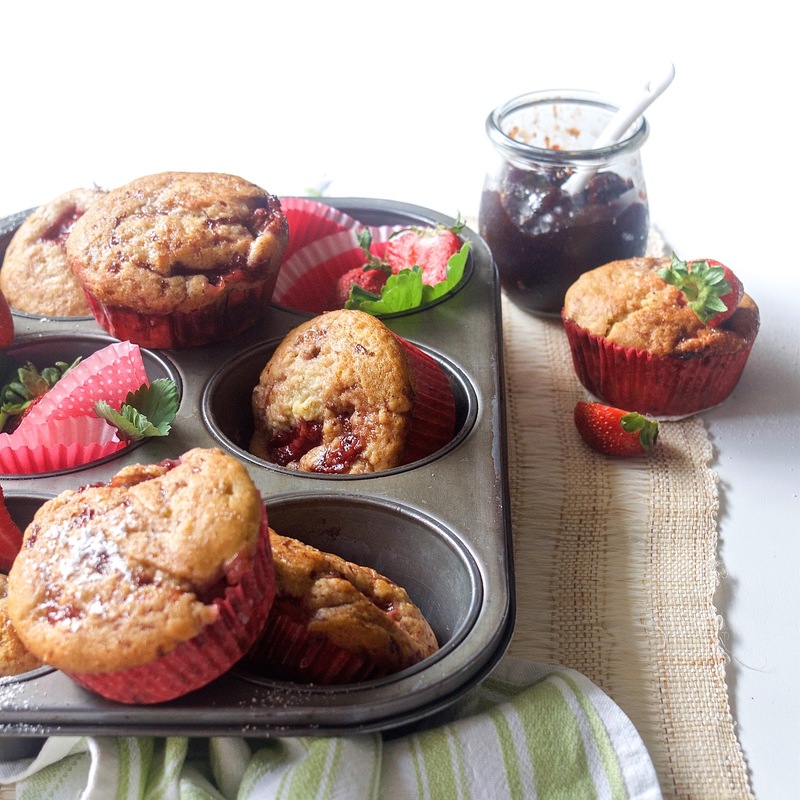 The story of how these particular muffins came to be goes like this; I had some strawberries sitting in the fridge that needed to be used and I had the weird desire to make something with lemon zest in it. While I briefly entertained the idea of making a cake, I decided that I also wanted to make something I could keep in the freezer for a later day. Enter the muffin. Conveniently single serve sized, freezer friendly and open to endless flavour combinations! 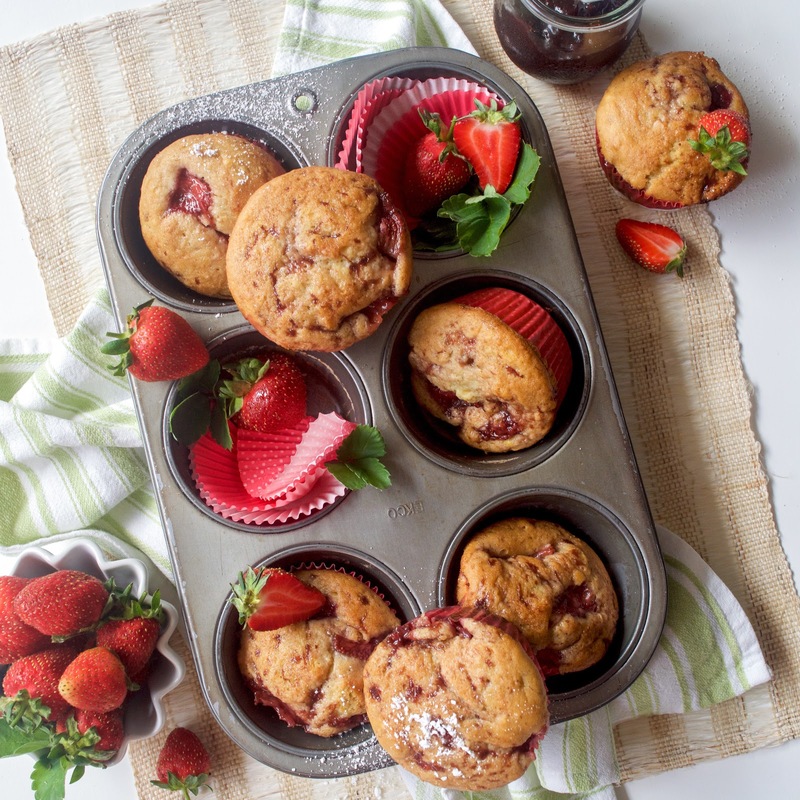 Then it occurred to me what a flipping fabulous flavour combination strawberries and lemon zest would make and voila - these muffins were birthed into the culinary world! I often talk about the dilemma that eggless baking creates for vegans. In baked goods, eggs act as a binding agent, so you can't just take them out and expect things to work perfectly. The good news is that there are a myriad of options available for vegans to replace eggs in baking, the bad news is that they all kind of work a bit differently and you sort of have to pick the right one for whatever it is that you're baking. For these muffins I used a rather unconventional combination of two things to act as a binder - aquafaba and banana. Put together in a sentence like that makes things sound, quite frankly, a bit ew, but trust me, IT WORKS, and it works damn well! The aquafaba, which is the liquid part of canned beans/chickpeas (hear me out!!! ), is literally undetectable taste wise and the banana is subtle, so it's truly the strawberries and the lemon zest that take centre stage here! 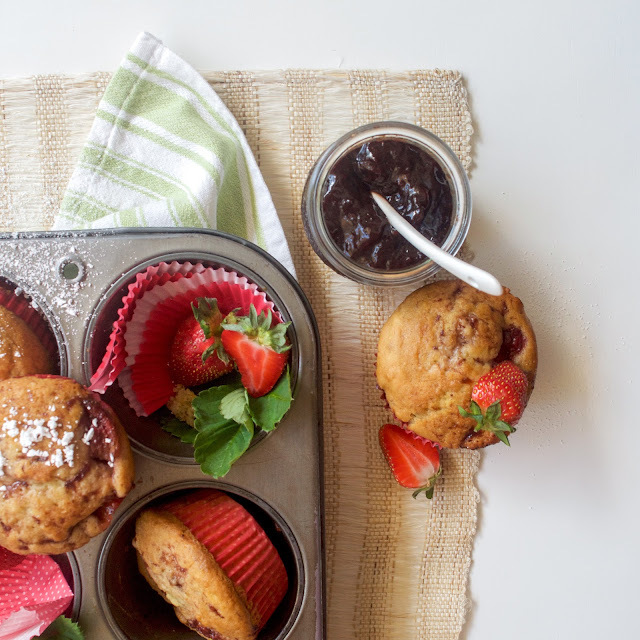 These muffins are perfect for a mid-morning snack (as tested by your's truly, xoxo) and would make the PERFECT addition to your next afternoon tea with friends (assuming that's a thing we still do/isn't just a grandma thing....). Put one in your lunchbox, eat one as a sneaky pre-breakfast snack - I can guarantee that whichever way you have these muffins, they'll be mighty tasty, super fluffy and basically the best thing ever. (Big call, but nonetheless v true). Happy days!! 1. 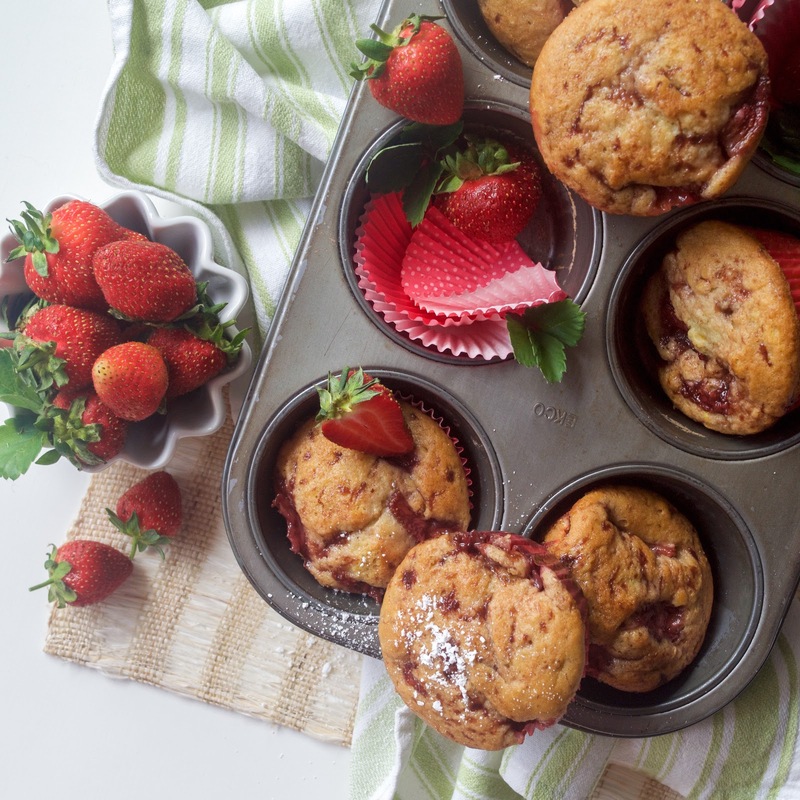 Preheat a fan-forced oven to 180 degrees Celsius and line a muffin tray with patty pans (aesthetic suggestion - use pink ones! They work SO WELL with the strawberries and we all know that eating with your eyes is a thing okay!). 2. In a small saucepan over low-medium heat, combine the quartered strawberries and the strawberry jam. Stir continuously until the jam starts to become more liquid-like and the strawberries stew a little. This should take approx. 10 minutes. When the strawberries are cooked, remove from the heat and set aside. 3. In a large mixing bowl, combine the vegan butter, sugar, vanilla bean paste and aquafaba using an electric mixer until they're all creamed together and light and fluffy - you'll want to mix them for around 5 minutes to put enough air in the mix to make the aquafaba do it's thing properly (it's baking chemistry, just go with it!). 4. Add in the banana, maple syrup and lemon rind, mixing through well. 5. Add in the flour, baking powder and plant milk, manually folding them through the mix a little first and then mix through with the electric mixer until you have a thick and smooth mixture. 6. Take your lined muffin tray and scoop approx. 1 tbsp muffin mixture into the bottom of each patty pan. Then scoop in a spoonful of your stewed strawberry mixture, gently swirling the strawberries through a little. 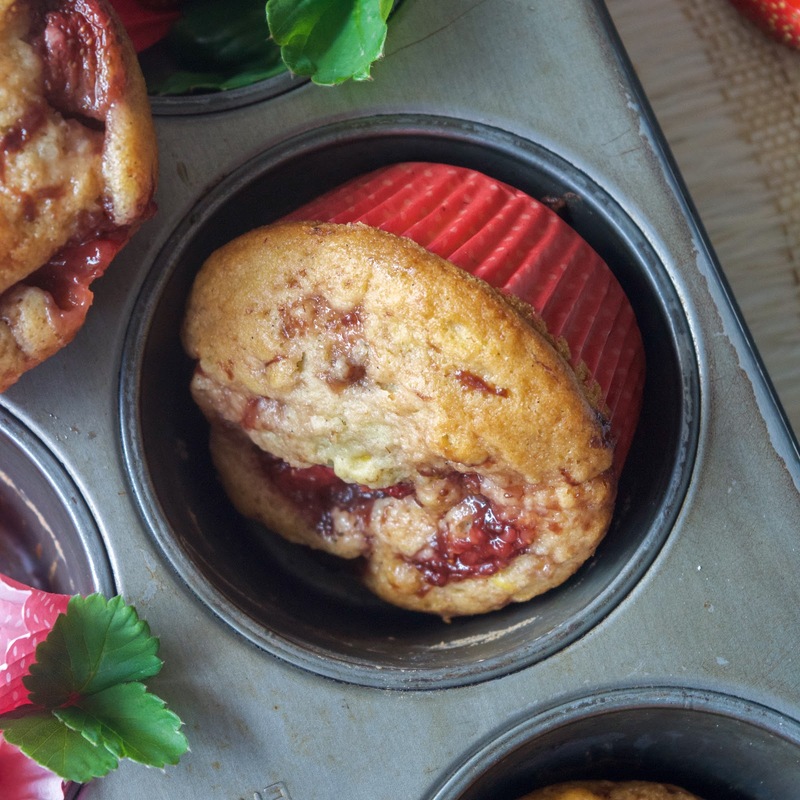 Add in another tbsp muffin mixture, then another spoonful strawberries on top, again swirling the strawberry mix through a little to create a kind of marbled effect. Repeat till you've used up all your mixture. 7. Place in the oven and bake for approx. 25 minutes or until the tops of the muffins are golden brown. They should be relatively firm to the touch and they'll smell ridiculously good! 8. Allow to cool slightly then serve. 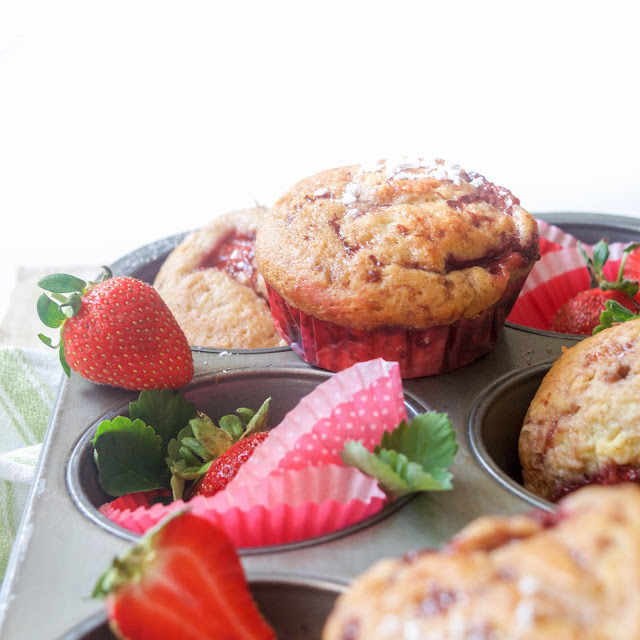 I think these are best served warm, so if not eating immediately, I suggest a quick zap in the microwave before eating, purely because warm muffin feels kinda like giving yourself a giant hug, culinary style, and that's really underrated if you ask me! *aquafaba is the liquid from a can of beans/chickpeas - I know that sounds kinda whacky but trust me, it's a vegan baker's secret ingredient!!! The advice and information contained in this website are a product only of my personal experience, opinion, understanding and learning. I strongly urge you to seek information from a professional and/or scientifically reliable sources. I am not a nutritionist, dietician or medical professional and therefore any information contained on my site is that of a general knowledge and understanding. I urge you not to take any of the information contained on The Orange Kitchen as medical advice and recommend that you always seek the opinion of a medical professional when undertaking any substantial change to your lifestyle.